DO MORE FOR CHEAPER... If you would have came here first you would be driving already!!!! We say yes when the others say no!!! Come test drive this 2002 Chevy Astro!!!! We accept all credit situations!!!! Heritage Motors is family owned and operated! We are a BUY HERE PAY HERE and have been in business for over 20 years!! Heritage Motors is now reporting credit through Equifax!! Come grow your credit with us!! Largest inventory is Central ARIZONA and Tri-Valley Area!! HOME OF THE $200.00 MONTHLY PAYMENT! !Heritage Motors is located in Arizona the home of cactus jack rabbits, and dry heat. Come in and let us work our magic auto sales for you to get the best auto deals possible, and Drive Now. Its Drive time lets get you into a premier auto for you and your family, and take auto action now!!! We cover all of AZ from Tucson to Flagstaff, Yuma to show low, Maricopa to globe, Phoenix to Sierra vista, Come see why we are the best in the business!!! 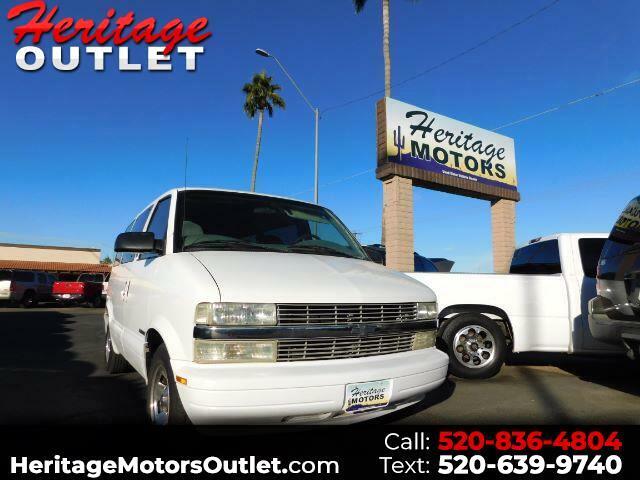 Visit Heritage Motors Outlet online at www.heritagemotorsoutlet.com to see more pictures of this vehicle or call us at 520-836-4804 today to schedule your test drive. Message: Thought you might be interested in this 2002 Chevrolet Astro.